Only 700 houses on Brownfield land? There’s vacant office buildings, sites earmarked for other development where building hasn’t started and derelict buildings on Fleet high street and in Hook. The sites he found include sites like Sun Park near J4A of the M3; Hartland Park near Pyestock; much of Ancells Farm at Fleet; Bartley Wood and other areas in Hook. If you know of sites you would like Bravehart to visit and photograph as examples of where we could be building instead of over our beautiful green fields, the please do get in touch with the We Heart Hart campaign through the website or this page. Surely it is better to build on these brownfield sites before concreting over our green fields. Photos of these sites are shown in the slider. A new town in Hart, whether located in Winchfield or anywhere else, will not meet the needs of the growing ageing population. We run the risk of building the wrong type of housing in the wrong place to cater for the excess housing needs of Rushmoor and Surrey Heath without meeting the needs of Hart, and concreting over our green fields in the process. The demographics of the district are changing. According to council documents, by 2031, there will be an additional 10,000 people over 60 (including more than 6,850 over 75) expected to be living in the district and an extra 3,620 people who will be suffering from dementia or have some sort of mobility problem. A higher quality of life for its residents. The report notes that 92% of residents are very happy and contented and most would recommend their accommodation to others. Improved health for residents and reduced impact on the NHS. As specialist accommodation is designed for impaired mobility, residents can manage better and spend fewer nights in hospital. Good for the environment. 51% of residents said that their energy bills were noticeably lower than they had been in their previous homes. What is more, the elderly tend to own fewer cars and tend to travel less once living in retirement housing. Retirement housing boosts local neighbourhoods. Older people regularly use shops and local facilities during weekdays, when they are often underutilised, and at weekends. 80% use the shops almost daily or often; over 40% used the library or post office almost daily or often. Retirement housing has a positive impact on local housing markets. On moving, most residents free up a substantial family home, with two thirds moving from homes with three or more bedrooms, freeing up housing stock for families. However, the SHMA says that Hart should continue to build housing in line with the current housing stock profile. The impact of this is that we will concrete over our green fields with traditional housing estates and not meet the needs of our growing elderly population and leave the shopping areas in the centre of our towns to wither away whilst increasing congestion all over the district. The We Love Hart campaign says this is the wrong approach and we should focus on building specialist accommodation for the elderly in higher density brownfield sites near to town centres, perhaps alongside high quality affordable flats for the younger generation. 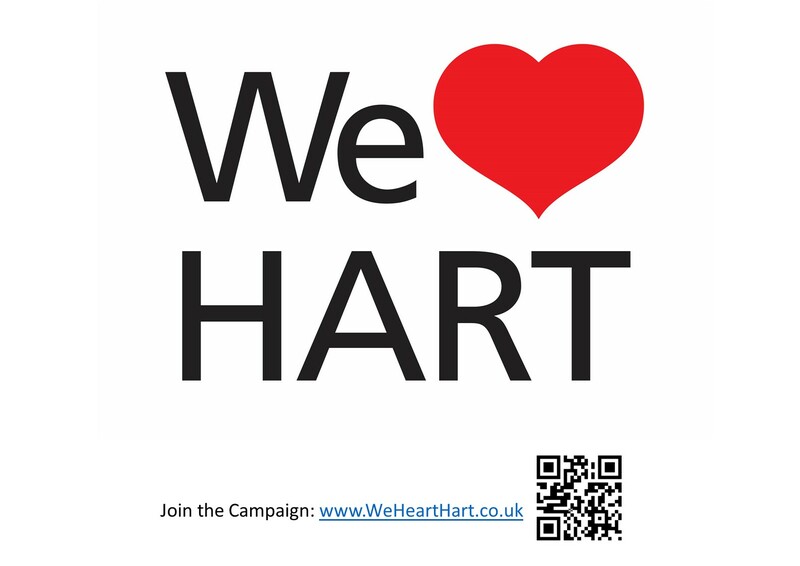 Here is an A4 poster to promote the We Heart Hart (aka We ♥ Hart and We Love Hart) campaign. Please print it out and post it in your window and on post it on village notice boards. The We Heart Hart Campaign (aka We Love Hart and We ♥ Hart) have now started a campaign on 38 degrees to petition Hart Council to change its approach to the Hart Local Plan. This petition can be found here: https://you.38degrees.org.uk/petitions/we-hart. Please support this petition by signing it and sharing it with all your friends via e-mail, Facebook and Twitter. We need to protect all of our parishes including: Blackwater and Hawley; Bramshill; Church Crookham; Crondall; Crookham Village; Dogmersfield; Elvetham Heath; Eversley; Ewshot; Fleet; Greywell; Hartley Wintney; Heckfield; Hook; Mattingley; North Warnborough; Odiham; Rotherwick; South Warnborough; Winchfield; and Yateley from this invidious plan. 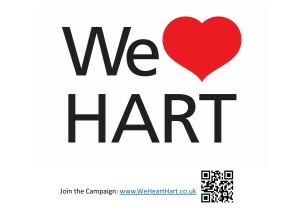 Today marks the launch of the We Heart Hart campaign (aka We Love Hart and We ♥ Hart). To call for the overall housing allocation to be reduced by challenging the SHMA in front of the Inspector. 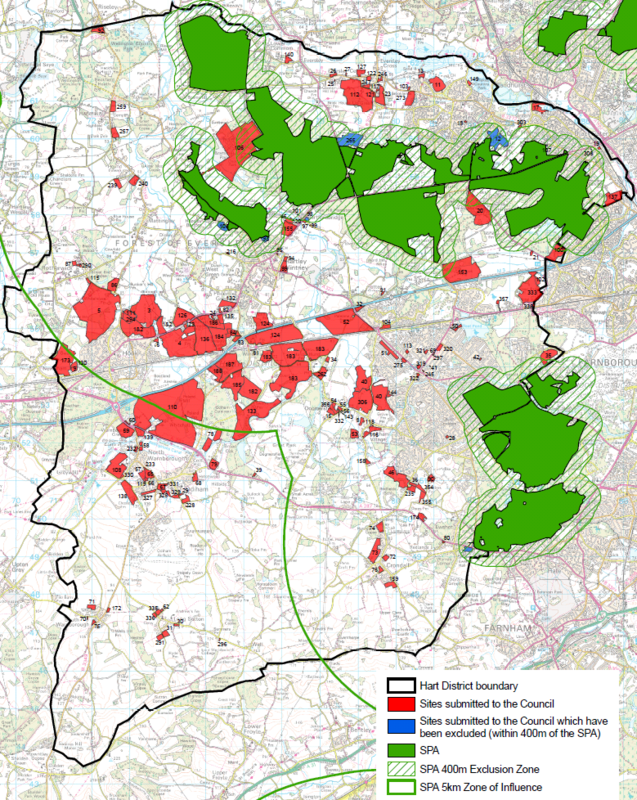 To demand that the Council develops a vision and strategy for Hart that retains its role as a rural, green hinterland for NE Hampshire that respects the separate character and identity of Hart’s settlements and landscapes and preserves the green spaces as amenity space for the urban settlements. To require that the housing need is met by building on brownfield sites and increasing density in our existing urban areas to help rejuvenate our existing shopping centres. To request that future housing stock reflects the needs of the changing demographics of the district, particularly the elderly and infirm. To petition the council and government against any new settlement in Hart that will act as a sink for the unmet housing need in neighbouring areas. To hold Hart Council to account to ensure the process is legal and transparent and properly consults all of the residents of Hart. What’s Wrong with the Housing Target? The December 2014 version of the Strategic Housing Market Assessment (SHMA) for Hart District Council, and Surrey Heath and Rushmoor Borough Councils (together the Housing Market Area) can be found here. The starting point for the housing need is population projection. The Department of Communities and Local Government (DCLG) population projections would lead to an overall need for 790 houses per annum across the whole Housing Market Area, or 15,800 houses in total. This approach in itself essentially says that if you have carried out lots of development in the past (such as Elevetham Heath, Queen Elizabeth Barracks and St. Mary’s Park), you must continue to develop at that rate even though there has been net migration out of the area in recent years. However, the report then states that the ONS usually understates these requirements so cherry picks inward migration data from the time we were building most housing, reverses the recent trend in average household size makes an arbitrary adjustment upwards to 925 houses per annum, leading to a need for 2,700 additional houses over the plan period and taking the total to 18,500. During the unsustainable economic boom from 1998 to 2008, the whole housing market area created jobs at around 720 per annum. Over the full economic cycle from 1998 to 2012 the whole area generated jobs at a rate of 529 per annum. The report assumes that up to 2031 the area will create jobs at more than double this, at a rate of 1,130 per annum. This has the effect of increasing the number of houses required to 1,180 per annum, or a total of 23,600 houses. Over the plan period this leads to a need for a further 5,100 extra houses being required. The combination of these and other assumptions is that the combined area of Hart, Surrey Heath and Rushmoor needs to build an additional 7,800 houses (of which around a third is allocated to Hart District) over and above the government starting point which adds to the pressure on our green spaces and adds to congestion. The impact on Hart is we have to build 7,534 houses. But Surrey Heath and Rushmoor have said that we need to build 3,100 houses that they say they can’t build in their own area. This pushes up our target to around 10,600 houses. If the questionable assumptions in the SHMA were taken away, our housing target would fall substantially to around 6,100 houses, but there may be opportunities to shift some of our remaining target on to Surrey Heath and Rushmoor. Hart is a beautiful district made up of a mixture of large urban settlements such as Fleet and smaller village type settlements such as Odiham. The space around these settlements is largely made up of green fields and woodland which give Hart its essential rural feel. In December 2014, for the fourth year running, Hart was named the best place to live in the country in a survey by the Halifax. Each settlement has a distinctive community feel; the quality of the schools is excellent and the 84 square miles of green fields and wooded landscape are a perfect example of England’s green and pleasant land that is excellent for wildlife, cycling and walking. This essential nature of Hart is now being put under pressure by the National Planning Policy Framework and Hart Council’s response to it. In the years up to 2031, Hart has to build another 7,500 homes. Hart Council is proposing to meet the bulk of this need by building a new settlement in the heart of Hart at Winchfield destroying over 700 acres of green fields and woodland in the process. We are mounting a campaign against these proposals because we believe the Strategic Housing Market Assessment that gave rise to the need for 7,534 extra houses (not to mention the extra 3,100 houses from Surrey Heath and Rushmoor) is flawed and Hart’s response to this is inappropriate. Blackwater and Hawley; Bramshill; Church Crookham; Crondall; Crookham Village; Dogmersfield; Elvetham Heath; Eversley; Ewshot; Fleet; Greywell; Hartley Wintney; Heckfield; Hook; Mattingley; North Warnborough; Odiham; Rotherwick; South Warnborough; Winchfield; and Yateley.